Stuffed peppers is a great all-purpose dish. They can be appetizers or they can be casual main course. My favorite stuffing to use in stuffed peppers are usually grains of some sort. 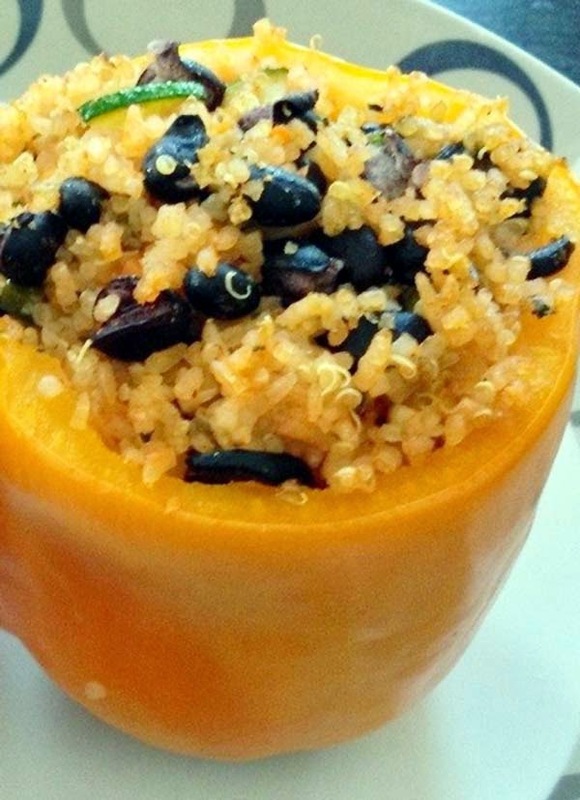 There's a recipe here for quinoa stuffed peppers. In this particular case, Mexican rice is used primarily. Some leftover quinoa is thrown in and can be seen in the picture, but these are not part of the recipe and can be left out altogether. Adjust rack to middle position and preheat oven to 350 deg F.
Place rice in a fine mesh strainer and rinse under cold running water until water runs clear- about 1 1/2 minutes.Shake rice vigorously to remove excess water.This step removes the starch from the rice so it will not stick. IF YOU OMIT THIS STEP YOUR RICE WILL NOT BE DRY AND FLUFFY. Remove ribs and seeds from 2 jalapenos and discard. Mince flesh and set aside. Mince remaining jalapeno. Set aside. Drop a few rice grains in and if they sizzle then it is ready. Add rice and fry stirring until rice is light golden and translucent, about 6-8 minutes. Be careful that the oil doesn't get too hot too fast or the oil will splatter. Process tomato and onion in processor or blender until pureed and thoroughly smooth. Transfer mixture to measuring cup and reserve exactly 2 cups. Discard excess. Reduce heat to medium, add garlic and 2 minced jalapenos and cook , stirring constantly until fragrant, about 1 1/2 minutes. Stir in broth, pureed mixture,tomato paste, and salt. Increase heat to medium high, and bring to a boil. Cover pan and transfer pan to oven to bake until liquid is absorbed and rice is tender, 30-35 minutes.Stir well after 15 minutes. Stir in cilantro, minced jalapeno to taste, and pass lime wedges separately. Finish the stuffing by mixing black beans and sliced black olives to the prepared rice. Measure 1 cup of rice mix and stuffed into bell pepper. Arrange stuffed bell peppers onto a baking pan and bake for 20 minutes.